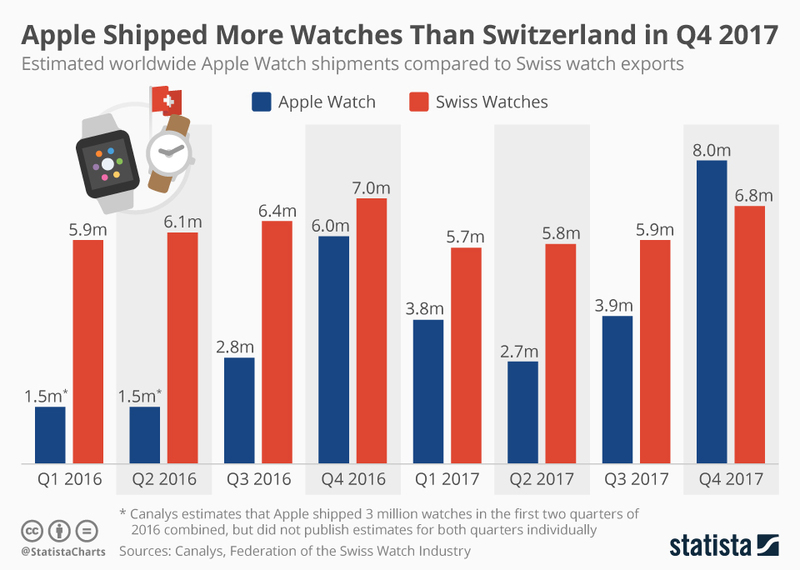 In Q4 2017 – essentially during the last holiday season – market research firm Canalys found that more people bought Apple watches than Swiss watches. Two million more, to be exact. Brian Heater has more data but this news is quite problematic for the folks eating Coquilles St-Jacques on the slopes of the Jura mountains. The numbers are estimates based on market data but they still point to a trend. In Q1 2016 Apple shipped 1.5 million watches to Switzerland’s 5.9 million. The intervening quarters were about the same until the launch of the Apple Watch 3 in September 2017, just in time for holiday shopping. The boost of a new phone and a new watch at the same time meant a perfect storm for upgraders, driving the total number of Apple Watches sold past the Swiss watch sales numbers. Wearing watches is, as we all remind each other, is passé. “I check the time on my phone,” we said for almost a decade as phones became more ubiquitous. Meanwhile watch manufacturers abandoned the low end and began selling to the high end consumer, the connoisseur. Sales of low- to mid-tier watches – and a mid-tier watch can range in price between $500 and $3,000 (and I would even lump many $10,000 watches in the mid-tier category) – were stagnant while the true cash cows, the expensive watches for the ultra-rich, fell slowly from a high in 2014. This coincides with falling purchases in China as what amounted to sumptuary laws reduced the number of expensive gifts given to corrupt officials. Sales are up as December 2017 but don’t expect much of a bump past the current slide. As a lover of all things mechanical – I did ruin a few years of my life writing a book about a watch – I look at these trends with dismay and a bit of Schadenfreude. 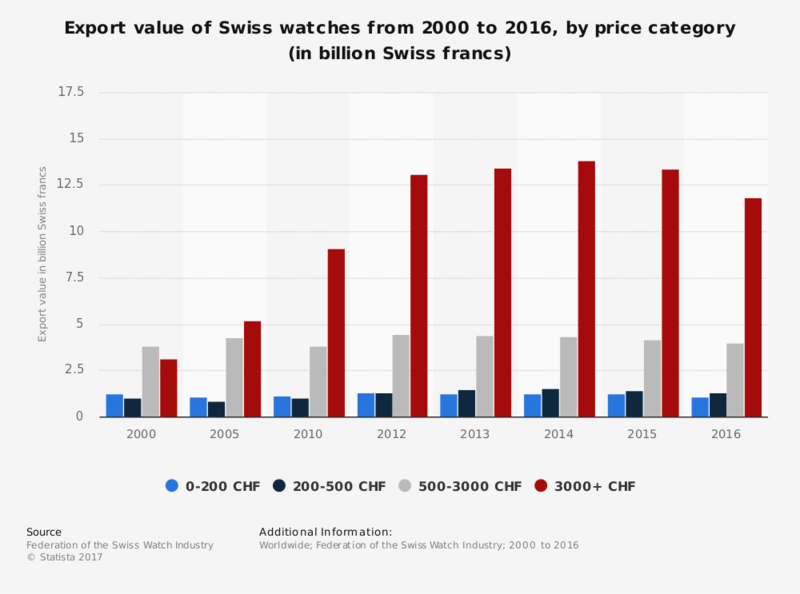 As I’ve said again and again the Swiss Watch industry brought this on itself. While they claim great numbers and great success year after year the small manufacturers are eating each other up while nearly every major watch brand is snooping around for outside buyers. There is no money in churning out mechanical timepieces to an increasingly disinterested public. As time ticks ever forward things will change. The once mighty Swiss houses will sink under the weight of their accreted laurel-resting and Apple will move on to embedded brain implants and leave watches behind. The result, after a battle that raged for more than four decades, will be a dead Swiss industry catering to a world that has moved on.